Alternative Press brings you the second track-by-track video commentary with BROADSIDE vocalist Ollie Baxxter. 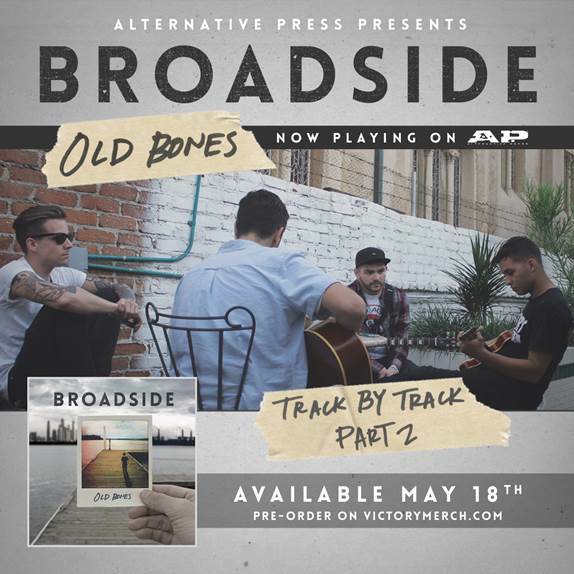 Heralded as one of AP’s “100 Bands You Need To Know 2015”, get an in-depth look at what went into creating one of the most infectiously dynamic pop-punk releases of the year, Old Bones. You saw Part One, now watch as Baxxter details the meaning behind the first single “Coffee Talk”, as well as future favorites, “The Simple Type”, “Damaged Kids”, “A Light In The Dark”, and the punchy title track closer “Old Bones”. Stay tuned for the full length music video for “Playing In Traffic” and BROADSIDE tour dates coming soon. Old Bones will be available everywhere on May 18th. Pre-order packages are available now at Victory Merch.